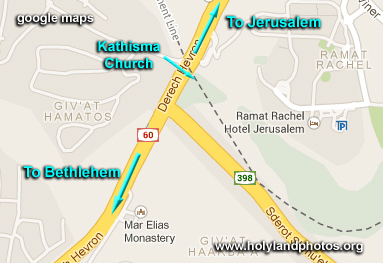 The “Kathisma Church” is located about half way between New Testament Jerusalem and Bethlehem. It was built around A.D. 456 to commemorate the spot where, according to the Protoevangelium of James, Mary rested (Kathisma, Greek for “seat” or “chair”) on the way to Bethlehem. It is octagonal in shape—actually with three concentric octagonal walls—with a large apse area on the eastern side. Often a special church, called a martyrium, was built in the shape of an octagon—probably to facilitate processions in the building. Examples from Israel include churches from Capernaum, built over St. Peter’s house, and one at Caesarea. Between the two outer octagonal walls are four good-sized chapels—on the northwest, northeast, southeast, and southwest. The floors of the chapels were covered with geometric and floral mosaics. In the center of the octagon is a large stone (bedrock?) that was probably venerated as the spot where Mary rested. The church was turned into a mosque when the Muslims conquered Palestine in the seventh century. 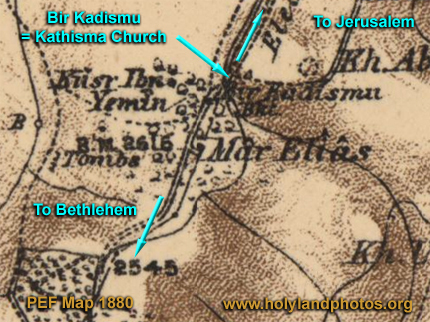 For a recent description of this church see Hershel Shanks, “Rediscovering the Kathisma—Where Mary Rested.” Biblical Archaeological Review 32, no. 6 (November/December, 2006): 44–51.